Never before have there been so many gizmos and gadgets for staying connected. With devices like the iPhone, iPad, Kindle, Droid and iPod touch, it's entirely possible to fit your entire life conveniently in a purse, everything stored on a couple of palm sized squares of carbon fiber and plastic. Every year, Americans spend millions investing in the latest version of whatever "i" thing is out at the moment. Coincidentally, we also spend mucho moo-lah each year on clothing and accessories . Famous designers have taken notice of the tech craze (duh, how could they not?) 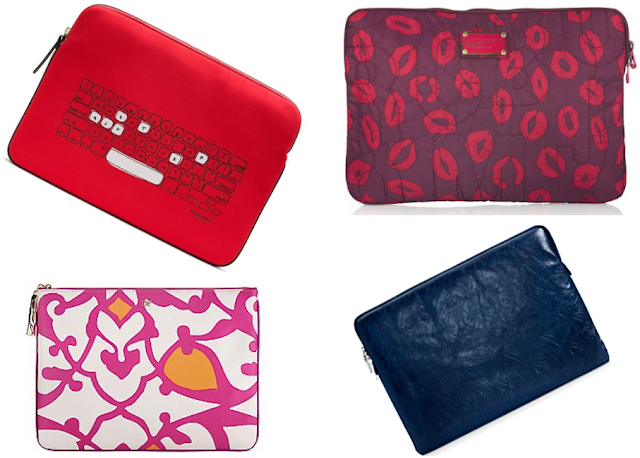 and come up with their own chic covers for laptops, Kindles, Nooks and beyond. I must confess, I don't even have a cover for my iPhone. My poor excuse for a laptop bag looks like a piece of Samsonite luggage from the 1980s. My Kindle case is cute, (black leather with a ribbon trim), but if I'd known there were so many other options, I might have upgraded. I mean, who knew Diane von Furstenburg did Kindle covers?! Now I don't have an iPad, but these cute covers make me wish I did. One of them is designed by Oscar de la Renta. Hello! Fabulous. What gadgets do you own currently? Are they tricked out or just plain Jane? Do tell! We own droids (which we have cheap cases on), ipods with no cases, and our iPad has a plain black case. I wanted to get more creative, but it is hard to justify fancy cases...if I was more daring I would probably buy them. 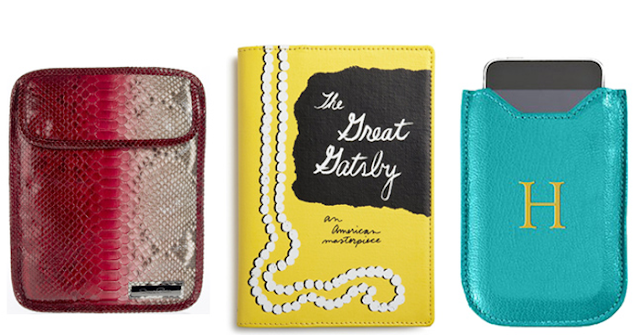 That Kate Spade kindle cover makes me want a kindle. bad. I just ordered a new iphone cover in a chevron pattern with my monogram from daninotes. I can't wait to get it and replace my boring clear one.. Guess it makes sense but whoa! Those are probably pricey. I just have a hot pink case for my i phone. My fav color. Who knew there were so many great options! You would probably love my post on wedding shoes earlier this week. Go check it out! These are so awesome! So pretty! I knew that there were decorative cases on the market but on my goodness! These are gorgeous! I really want a Kate Spade Book of the Month iPad cover! I've been tempted by the newsprint one, but I am in love with the Great Expectations print and really wish I could get it! My kate spade iPhone cover and Rebecca Minkoff Kindle cover make me smile every time I look at them! Who would have thought technology could be so fasionable? Kate Spade is always a winner in my book! Hub and I have iphones...but they're always out or in use, so who needs a case?! Haha! I am strictly an iPhone kind of girl (still in love with the old-fashioned book) and can't wait to splurge on a case when I upgrade to the iPhone5. That "H" Saks cover is calling my name. i have a pink jelly cover for my phone but i recently took it off because it was too bulky. i finally invested in a Jessica Simpson laptop cover which i adore but besides that no kindle or ipad for moi! ;) all of these covers are gorgeous however! I knew that a few companies were getting into this but I had no idea that so many were!